Not to be confused with Ironworks. Ironwork is any weapon, artwork, utensil or architectural feature made of iron especially used for decoration. There are two main types of ironwork: wrought iron and cast iron. While the use of iron dates as far back as 4000BC, it was the Hittites who first knew how to extract it (see iron ore) and develop weapons. Use of iron was mainly utilitarian until the Middle Ages, it became widely used for decoration in the period between the 16th and 19th century. In France, highly decorative iron balconies, stair railings and gateways were highly fashionable from 1650. Jean Tijou brought the style to England and examples of his work can be seen at Hampton Court and St Paul's Cathedral. Wrought ironwork was widely used in the UK during the 18th in gates and railings in London and towns such as Oxford and Cambridge. In the US, ironwork features more prominently in New Orleans than elsewhere due to its French influence. As iron became more common, it became widely used for cooking utensils, stoves, grates, locks, hardware and other household uses. From the beginning of the 19th century, wrought iron was being replaced by cast iron due to the latter's lower cost. However, the English Arts and Crafts movement produced some excellent work in the middle of the 19th century. In modern times, much modern wrought work is done using the air hammer and the acetylene torch. A number of modern sculptors have worked in iron including Pablo Picasso, Julio González and David Smith. It was introduced into Europe by the 14th century with its main decorative uses being as firebacks and plates for woodburning stoves in Germany, the Netherlands and Scandinavia. By the end of the 18th century, cast iron was increasingly used for railings, balconies, banisters and garden furniture due to its lower cost. Look up ironwork in Wiktionary, the free dictionary. 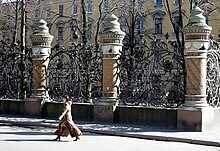 Wikimedia Commons has media related to Ironwork.